A maroon-colored clownfish with three white stripes that turn yellow as they mature. This species naturally lives among the tentacles of bubble-tip anemones (Entacmaea quadricolor). This natural behavior protects wild clownfish from predators. 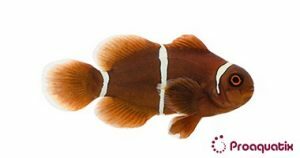 Proaquatix clownfish do not require anemone hosts but will accept them if present. This species is a case of convergent evolution, where it has independently evolved symbiosis with anemones, without inheriting this trait from phylogenetic relatedness to Amphiprion.